Please scroll down the page for application information! Working at Luther Park this summer can be a life changing adventure for you. It is something that you’ll remember for the rest of your life. It’s not so much the work, it’s the lifestyle. A community of faith gathered in an outdoor setting to learn and grow by playing and singing and celebrating. Life doesn’t get much better than this! better than that, through a summer at Luther Park you’ll gain life skills. Living within a close knit Christian community, learning to deal with conflict constructively, dealing effectively with sudden changes, and keeping your sense of humor under the strains and stresses are all life skills that you will develop while working at Luther Park. You will take these life skills with you when the summer ends. The camp community gathers as the “body of Christ.” The program is centered around helping and sharing. You help campers gain knowledge about themselves and the world around them. You teach them to live and work in groups harmoniously. You share your faith and skills and understanding with the people around you. You’ll find that by working with campers you’ll learn a lot about yourself. You’ll learn to trust your judgment. You’ll learn to communicate, to teach, to lead and to give of yourself. For some of you, it becomes a question of, “CAN I AFFORD TO WORK AT CAMP THIS SUMMER?” As a college student, if there’s one thing you don’t need a course in, it’s about tightness of money. Luther Park is a busy place, so you won’t have much time to spend all the money you make. In addition, our program offers lots of free things to do on your time off as well as lots of people to do things with. Consider the fact that your room and board (FREE FOOD!) and laundry expenses are all covered. Can you afford it? YES!!! A SUMMER AT CAMP IS A GREAT RESUME BUILDER. As we all know, the permanent job market is looking for more than just a college degree. Employers want experience. They want to see a successful track record in the real world. Working at camp may also fulfill some college internship requirements. Can a summer job change your life? It all depends on what you’re looking for. Over the last 80 years, countless staff have found a summer at Luther Park to be unforgettable and life changing! 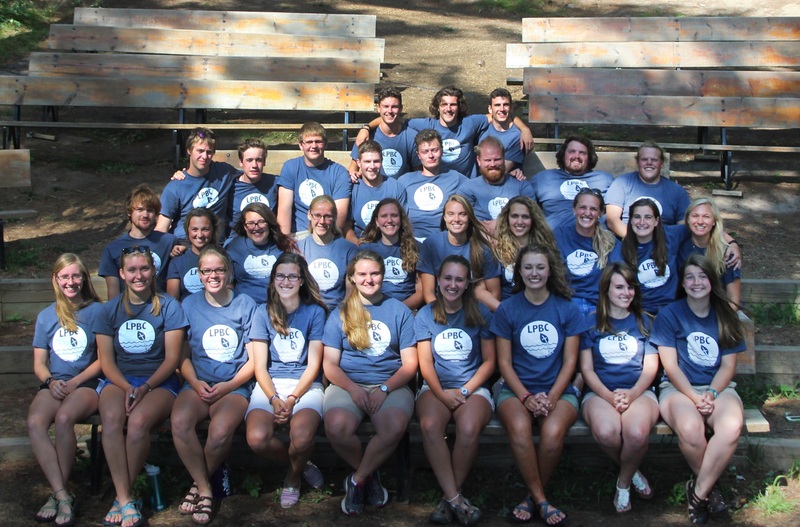 WORKING AT LUTHER PARK…is a chance to spend your summer in the Northwoods of Wisconsin exploring your faith as part of a supportive community and teaching youth as they encounter Christ in the outdoors. Want to join the Luther Park team in 2018? We are hiring faithful, dedicated, and energetic young adults who want to participate in a summer of ministry and community, with fun, games, music and life long friendships along the way! COUNSELORS: Counselors spend each week with campers in different programs at Luther Park or Luther Woods. Counselors live in cabins with campers; spend their days leading campers in activities, games, Bible study and more. LIFEGUARD/HIGH ROPES FACILITATOR : The main responsibility of the Lifeguard/High Ropes Facilitator ensures the safety of campers and staff at the pool and on the lake as well as on the high ropes course. The Lifeguard/High Ropes Facilitator must be at least 18 year old, hold a current lifeguard certification. Additional responsibilities include cleaning the pool, maintaining equipment, general ropes course care and maintenance and additional task as need around camp. Ropes course facilitator training will be offered onsite, you do not need to hold a current certification. VBS DAY CAMP LEAD COUNSELOR: The VBS Day Camp Lead Counselor is responsible for planning VBS Day Camp programs with congregations, preparing materials for each VBS Day Camp and communicating with VBS Day Camp teams the needs of each congregation. This is a support roll, the lead counselor will spend part of their time onsite preparing for each day camp and assisting in the daily needs at camp and part of the time will be spend out on VBS Day Camp interacting with congregation member, children, and staff. LEAD COUNSELORS: Lead Counselors work to coordinate camp activities, games, special events and more. Lead counselors will spend part of each day planning and coordinating and part of each day with campers and staff supporting them in any way possible. A Lead Counselor is an independent person who can work alone and with groups of people and will work closely with the Director and Program Director. WOODS/WILDERNESS LEAD: The Woods/Wilderness Lead will be responsible for program that take place at Luther Woods, Luther Parks 300 acre rustic site as well as wilderness programs that travel away from camp including canoeing, backpacking, and hiking. Experience leading youth in the back country, meal planning, risk management, love for the outdoor helpful in this position. When not out on a trip this position may serve as a counselor onsite at Luther Park, on a VBS or a support staff at camp! MEDIA SPECIALIST: The Media Specialist takes pictures of all groups every day, organizes pictures, posts to social media and creates a slideshow each week. When not taking pictures, the Media Specialist assists with camp program, operations, and worship. NATURE/FARM LEAD: The Farm Specialist takes care of the farm center and garden. The Farm Specialist teaches children of all ages every day about the farm, garden, natural surroundings and environmental education. When not teaching at the farm center, the Farm Specialist assists with camp program, operations, and worship. ARTS & CRAFTS LEAD: The Arts and Craft lead will plan, organize, and facilitate crafts for each group of campers scheduled at arts and crafts. When not teaching arts and crafts this position assists with camp program, operation, worship, and other tasks as assigned. KITCHEN ASSISTANTS: Kitchen Assistants prepare and served well-balanced meals and snacks to campers and staff daily. Additional responsibilities include dishes, ensuring cleanliness of the kitchen and dining hall, and assisting with program support when needed. NURSE/MEDIC: The Nurse or Medic is responsible for distributing camper medication, collecting and organizing health forms, maintain inventory of nonprescription medication and first aid supplies, maintaining health care record of campers and staff, and proving care for ill or injured campers or staff. Must be 21 years of age and hold a First Aid and CPR certification. RN, LPN, EMT, Nursing Students desired. MAINTENANCE ASSISTANT: The Maintenance Assistant works directly with the Property Manager to assist in the daily operations of camp. This position requires general maintenance skills, lawn mowing, and a person who can work independently on projects. Please complete the staff application and ask your references to complete the Reference Form. Return your application to Luther Park by mail, email or fax. During the process you will be asked for 3 references contact information, please have the information ready! We will contact you when we receive your application! We hope to see you at Luther Park this Summer! Why should I consider becoming a summer staff member at Luther Park? It is a fun learning experience where you can bond with peers and God and have fun doing it. Through Holy Play and great discussions, you’ll have an unforgettable summer! Camp is a time to listen and learn about God and to let your stress go. You are able to be a part of God’s creation and walk along side campers of all ages and hear the stories they have to tell. You get paid to sing, dance, worship God, and influence children’s’ lives! What could be better than that?!?! The community of fellow believers is incredible. The depth of relationship is indicative of our relationship with Christ. We believe God calls and tugs at peoples’ hearts in different ways. We can say that I became a camp counselor for specific reasons, first and foremost being that God tugged at my heart with it. God placed a desire in my heart to do ministry full-time and provided me an opportunity for it. I became a camp counselor because it was God’s will for my life. It’s a great way to reach younger generations. It’s not always easy, but at the end of the day, you have a feeling of peace. You know you impact people everyday, and that’s wonderful! To make life-long friends, to prepare yourself for your future career, to grow in your faith, to have an awesome summer and to make a difference in this world. It’s a summer you’ll never forget!